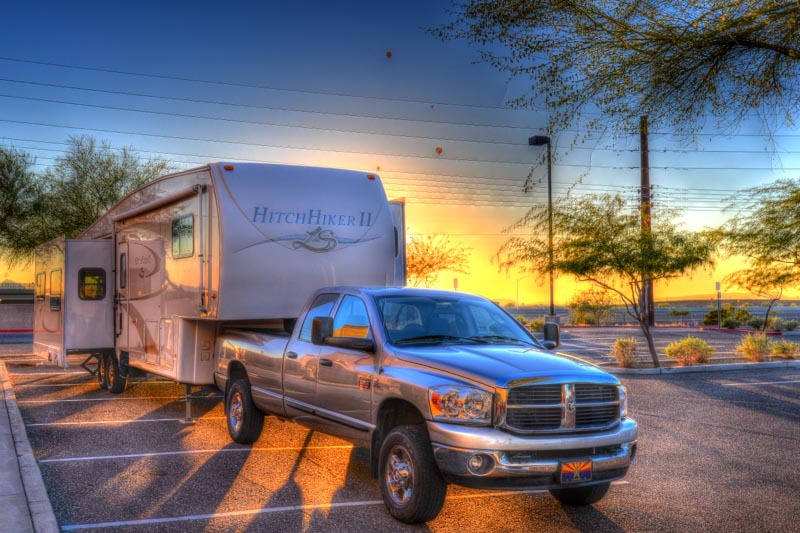 December, 2013 – After saying goodbye to our sailboat Groovy in San Diego, we pointed our truck towards Phoenix, Arizona. The truck bed was piled high with all of our stuff, and a new life waited for us down the road in our trailer. We decided to take it slow on our way there. We were both quiet and lost in thought as we began to climb through the hilly area that separates the moist and green San Diego coast from the flat, brown, dry deserts to the east. It’s a region of towering hills made of huge boulders that look like a giant bulldozer just dropped its load of rocks. 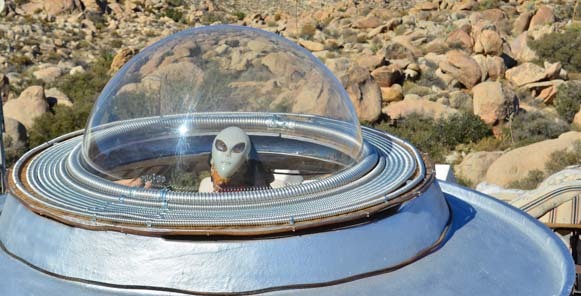 Yup, that’s an alien in there! 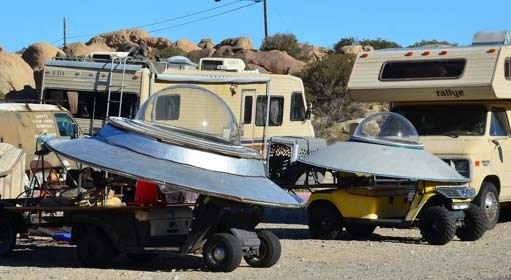 We had driven through this area many times, and every time we noticed a very strange collection of aliens, spacecraft and RVs parked off the side of the road. 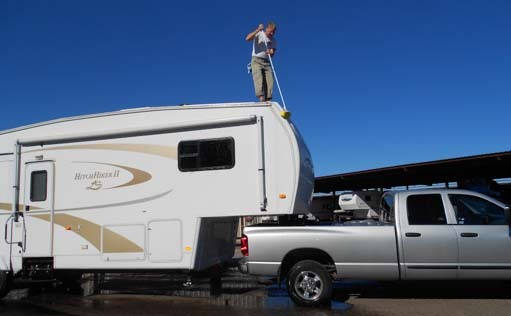 This time, rather than keep going as usual, Mark decided to pull off the highway. “I’ve always wondered about this place.” He said as he parked and reached in the back seat for his camera. We both hopped out and began to roam around. This funny place is a classic little piece of roadside Americana. 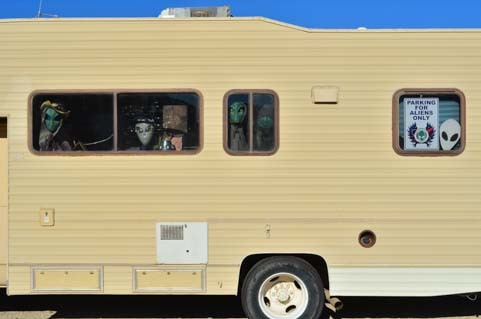 Someone has put alien figures inside of spaceships, motorhomes and assorted chairs and cars all along a frontage road. They’re the kind of aliens that have the slanted, almond eyes and small mouths set in lightbulb shaped heads. So strange! We wandered among these weird creatures, mystified. Who put this here? And why? 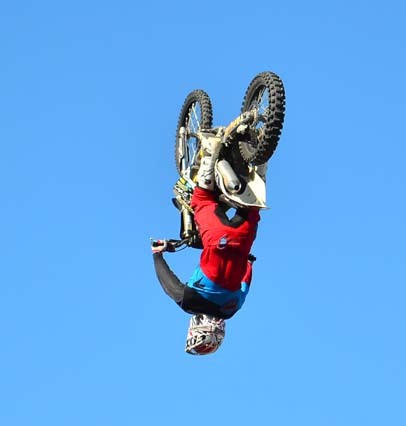 It’s crazy, but it’s fun! 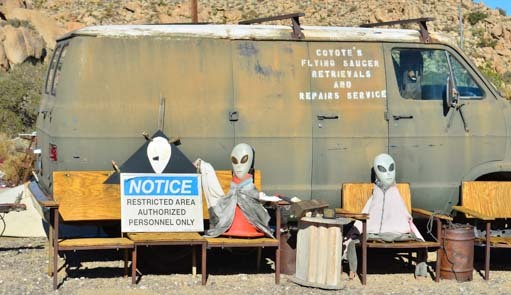 And there are some aliens sitting around in chairs! There’s a tower at the top of the hill that appears to be a museum, but there was a sign saying “Sorry, we’re closed today.” Oh well, next time! 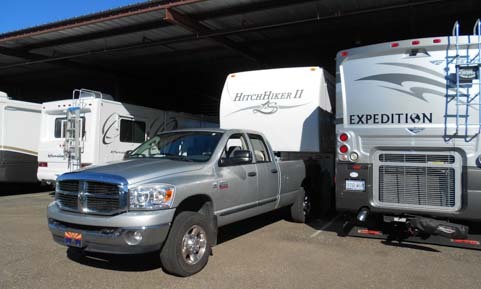 When we got to Phoenix, we went straight to the storage facility where our fifth wheel had been patiently waiting for us for over a year. I think it was very excited to see us, but when it saw the load in the back of the truck, its knees appeared to buckle a little. It was already a fully outfitted home, and now we were bringing endless boxes of stuff back to it that had absolutely nowhere to go. Yet it was all great stuff that we couldn’t bear to part with. Ugh! How do you combine two households into one, especially when the one you’re moving into is 350 square feet? You’ve gotta make some tough choices. And so it was. This spatula or that spatula? This set of socket wrenches or that one? And what to do with all those awesome but unused stainless steel fasteners and spare parts we’d bought for the boat? They might prove useful out on some remote road someday. We made many trips to Goodwill! And all that clothing. Oh my goodness! We could have dressed an army — in bathing suits and tank tops! 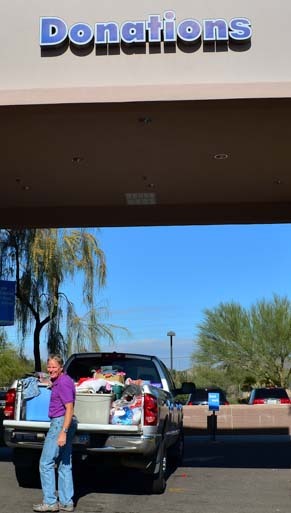 Over the ensuing weeks we became regulars at the Goodwill drop-off center, and slowly our mountain of bins in the back of the truck dwindled to the point where we could actually find homes for everything inside the trailer. A Mercury bared its teeth at us! This isn’t the kind of project that makes either of us leap out of bed in the morning with excitement. So we took our time as the holidays approached and did lots of other things. 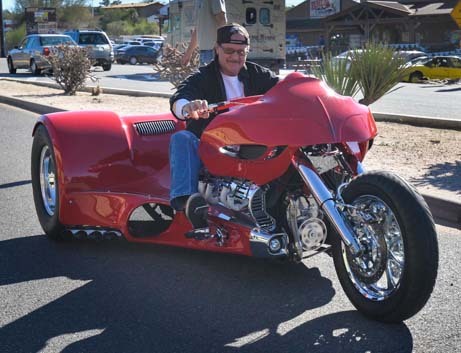 While out driving around in Cave Creek one day, we bumped into a car show. Mark can never pass up a chance to mingle with muscle cars, so we stopped to have a look. 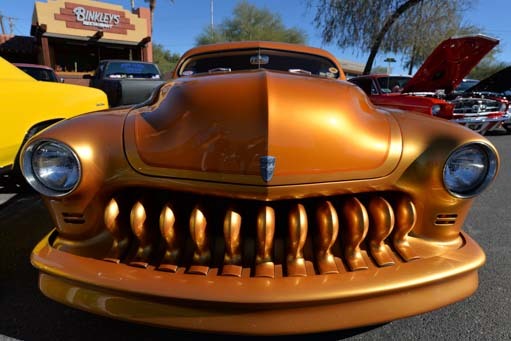 Arizona is a mecca for car enthusiasts, whether they are buying new exotics from the row of Maserati, Lotus, Ferarri and other dealerships in Scottsdale, or primping their old cars for shows like this. There were hot rods and rat rods and souped up cars of all kinds from yesteryear. There were even some unusual motorcycles, including a few trikes that rumbled down the road. 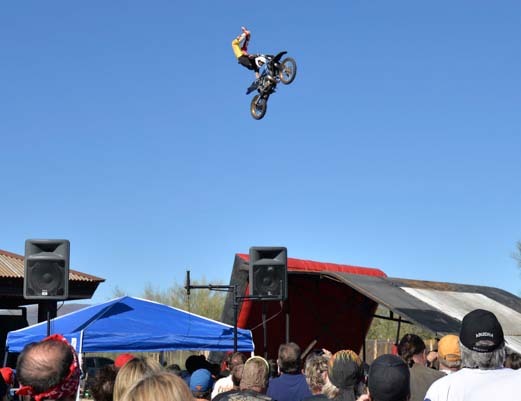 What really caught our attention, however, was the dirt bike jumping show. 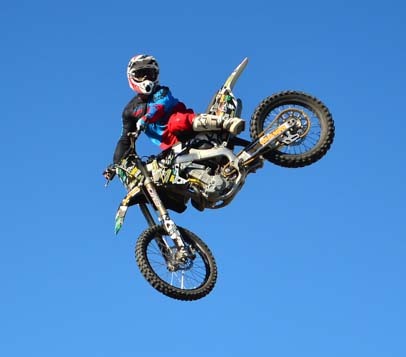 As the announcer began his patter on the microphone, we looked up to see a dirt bike flying high above the crowd. Wow! 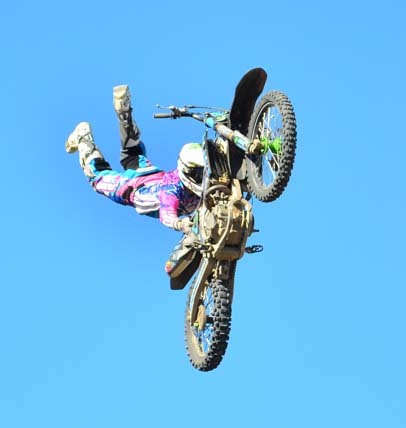 Those guys are crazy!! 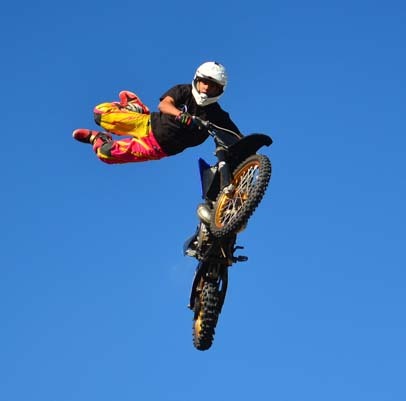 They were all young boys in their late teens — one was only 16 — and with every jump, they soared higher and higher, doing wild and daring tricks in the air. I was awestruck. We’ve seen this kind of stuff on TV, of course, but it was different to be standing so close that when they landed we could reach out and touch them. 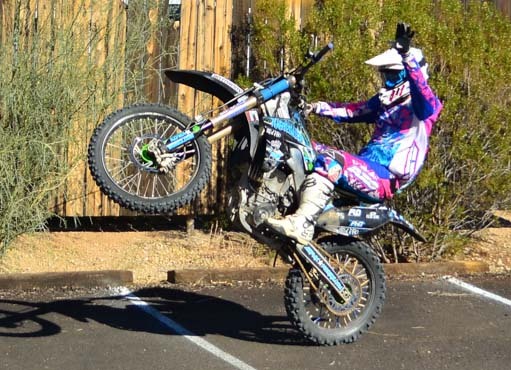 At the end they all did wheelies past the crowd. 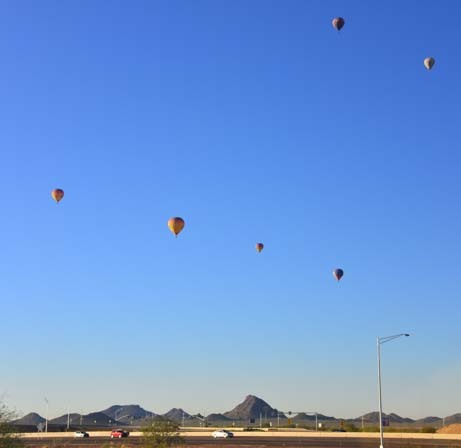 A more peaceful way to take to the skies around Phoenix is to go up in a balloon, and every morning the horizon was filled with them. 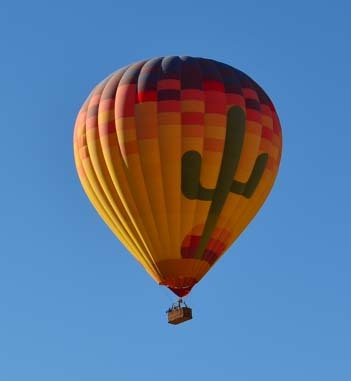 Sometimes we could hear the roar of their flame heaters before we saw them. 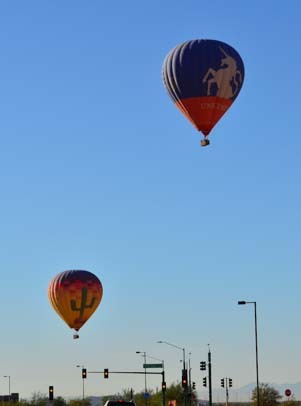 The balloons made wonderful, everchanging patterns in the air. Floating around in slow motion, they’d move up and down and drift past each other. We were both so happy to be back in the desert. 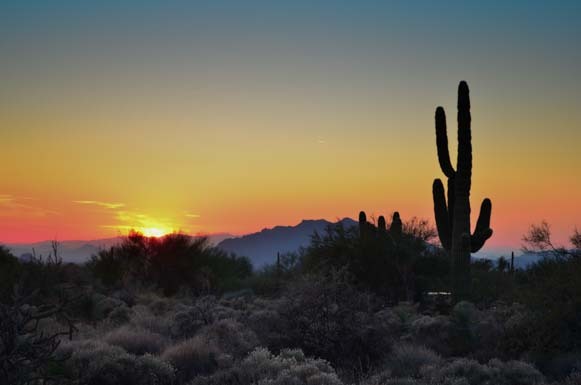 There is something about the Sonoran desert that is really appealing. 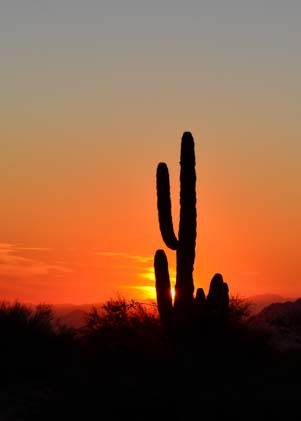 The cactus are so stately, and the sunsets are so colorful and varied. 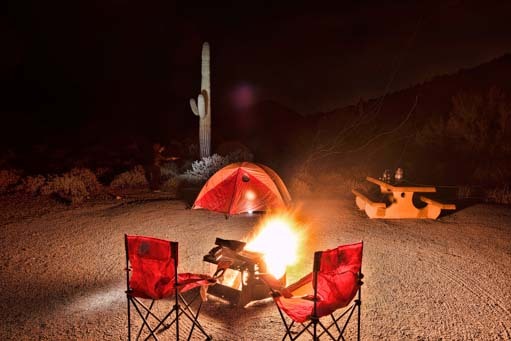 Our son went tent camping at Cave Creek Recreational Area campground, and we spent a few hours with him at his campsite. The campground was filled with RVs, and they all looked so snug and homey. Many of them had Christmas lights on. 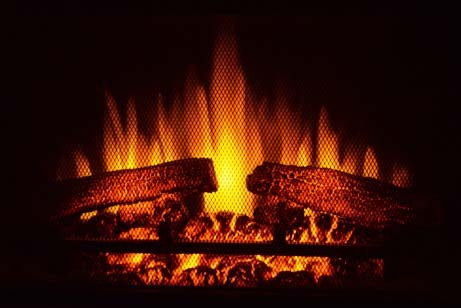 We hung around the campfire, relishing the smell of mesquite wood that filled the air. Even a brief downpour didn’t dampen our spirits, although we scampered off into the truck for the worst of it. 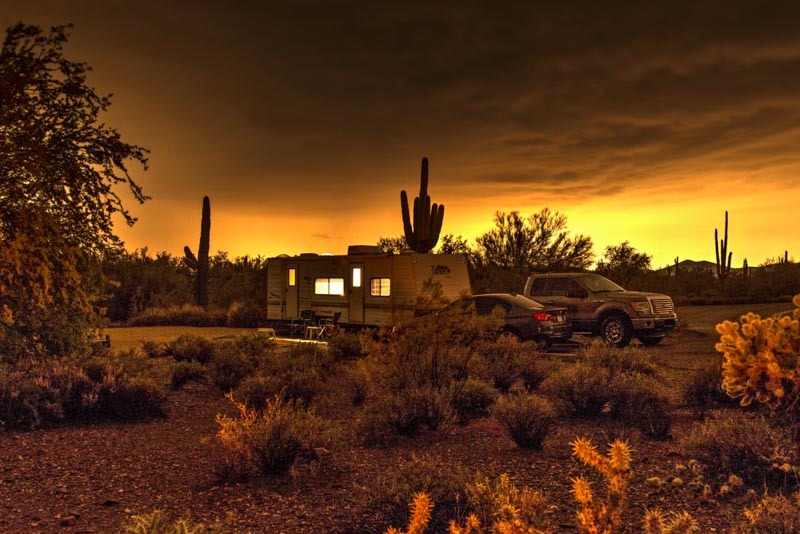 Cave Creek campground was full of RVs — and they looked so cozy and inviting! 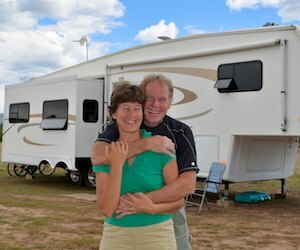 We suddenly had such a longing to get back into our fifth wheel. “Soon, soon!” we told ourselves. In the meantime, though, the holidays were here and were wonderful. 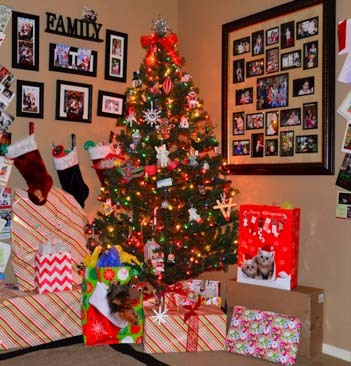 This was the first Christmas we had spent with our family in five years, and the coziness around the little fake fireplace in the living room was just as intimate and heartwarming as the real thing outdoors. Santa came with a bountiful array of gifts for everyone, and we spent a marvelous holiday season immersed in the world of our young granddaughters, where innocence, iPod games, Wii dancing, pizza and Barbie rule. Whew!! Our urge to set up housekeeping in our beloved buggy couldn’t be put off any longer, though, and the arrival of the new year saw us squeezing ourselves into the trailer alongside the last few boxes of unsorted stuff for an overnight, even though it was still parked in storage with no room to open the slides. Our buggy was glowing when it found out we were going out adventuring together. …and we were glowing too. Within a few days we were out on our own again, the slides pushed out, the last boxes of things sorted and stored, and our spirits sky high. 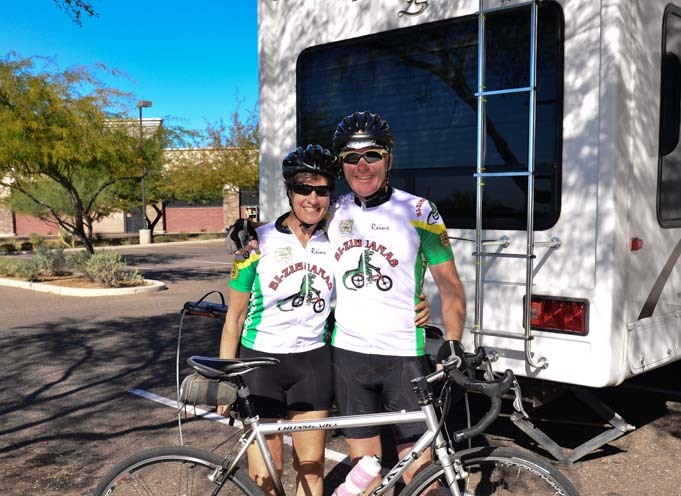 We grabbed our bikes, suited up in our new Mexican “Bi-Zihuanas” cycling jerseys — gifts from our friend Alejandro who owns the very cool Bi-Zihuanas bike shop in Zihuatanejo (story here about 1/2 way down the page) — and we set out to ride the fabulous bike lanes of greater Phoenix into the far reaches of the desert. It was our first real bike ride in ages, and it felt so good. The wind was at our backs, the sun was on our faces, and we were so thrilled be alive and so excited to be looking down the road towards the fun of travel and exploration once again.